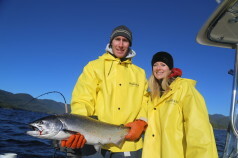 As we start another winter fishing season in Tofino we would like to do so by sharing our latest fishing report from our first winter charter last week. We had guests visiting from Calgary last weekend, taking a welcomed break from the early winter cold snap, exchanging minus 30 celcius temperatures for a balmy 12 degrees in the coastal Tofino sunshine! 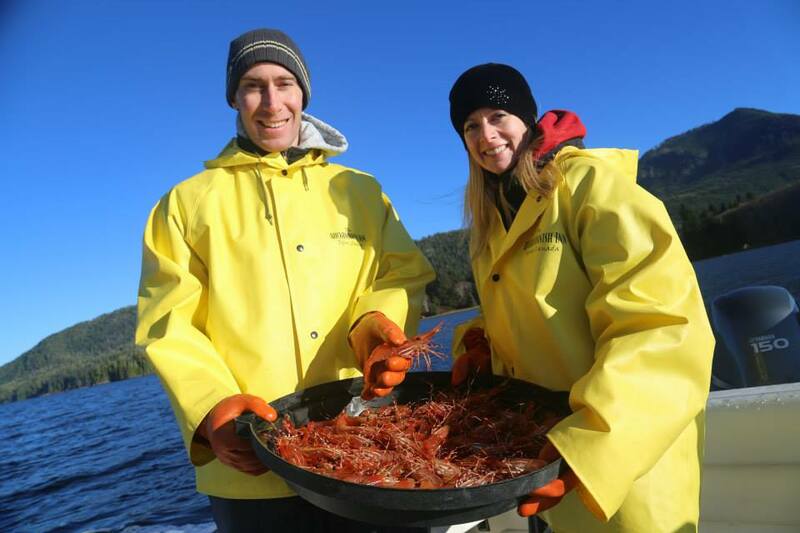 One of the many perks of visiting Tofino in the winter and with the occasional bout of warm, dry weather and sunshine, why not get out on the water to catch a winter chinook salmon; delicious spot prawn or feisty dungeoness crab! Although we left the dock at 8:30, the sun was still waking up and as we left the harbour shortly after, we were greeted by a magnificent sunrise as we ventured into heart of Clayoquot Sound. With not a cloud in the sky, we noted several bald eagles along the tree tops of the coastal islands as we weaved our way deeper into the protect waters of the sound. One of the main benefits of our winter fishing charter is that most of our fishing and trapping occurs in the protected waters that allows us to go in almost any weather. This is a huge perk to those with low mobility or for those sensitive to sea sickness, as the majority of our trips occur in areas of the sound that are completely protected by the wind and exposed swell. As we headed North, up the inlet, we encountered a huge raft of sea otters that numbered in the 50’s–one of the bonus wildlife viewing opportunities on our winter charters. We began our first hands-on experience with collecting our spot prawn traps that had been baited and soaking over night. Fishing the inlet edge of 200-300 feet of water proved effective as we unloaded the traps to accumulate approximately 300 plus spot prawns on this haul. With a few hitch-hiking red rock crabs, we were all smiles, largely satisfied and now on the run to meet the tide change to try our luck on winter chinook salmon. It didn’t take long as we hooked and lost our first salmon on our first pass a mere 10 minutes away from our prawn traps. Fishing the lower 30 feet of the 100-130 feet of water proved to be the most productive as we continued to hook numerous winter chinook salmon ranging in size from a few pounds to our largest at around 12 pounds. Using a army truck needlefish hochie on once side and a 3.5″ UV coyote spoon seemed to do the trick for as as we ended up keep the three largest ranging from 7-12 pounds. Finishing up the final leg of the journey, we end the trip by pulling up crab traps that have been pre baited and with a handful of fresh crab, we made our way to the dock for photos, cleaning and fish processing. Once the catch was cleaned, the dockside fish processor, Trilogy Fish Company, custom filleted the salmon and offer their over night processing service for our guests. It was all vacuum sealed and flash frozen, not too mention professionally packed for air freight as it is easy enough to check the package in the provided sealed box as checked luggage. The fish will remain frozen solid for almost 48 hours after it is packed, ensuring the quality contents. 1 (855) 726-3828 or email us at info@cleanlinesportfishing.com. We have fished with Blake for a while now and have nothing but awesome things to say about how he runs his operation, whether its the whole family going out, or just myself he has provided top notch fishing and scenery along the way to different locations. He has great knowledge of the wildlife in the area which is abundant, and his solid relationship with John at Trilogy makes things simple for processing and getting your catch home. I have fished in several locations along BC’s coastline and Blake and Tofino’s coastline provide the most consistent fishing by far!